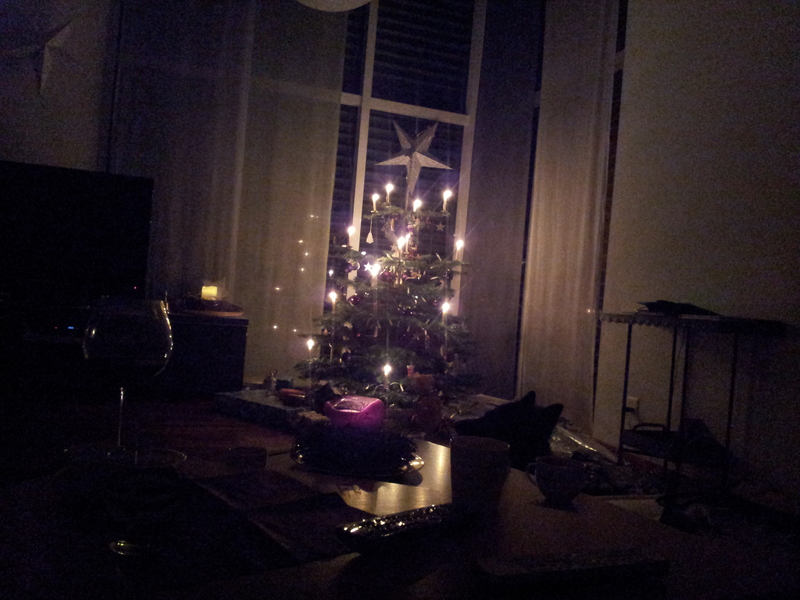 This year we spent Christmas Eve at Yves’ sister’s house with her partner S and her little girl M’ and boy L’. I guess you could say it was my first really Swiss Christmas, since it was the first time we had celebrated with children. December 24th is the day the Swiss celebrate Christmas, exchange presents and do the whole family dinner thing. Of course the all important, food, was a typically Swiss dish, Raclette as our main. The Swiss as a whole don’t really have a traditionally Swiss Christmas dish. Generally, they do something fancy or at least expensive. This Christmas being the Children were involved Raclette was the meal of choice. I absolutely adore Raclette, which is simply melted cheese and potatoes. You have this little table top cooker where you put these little spoon like spatulas in the heating device, the cheese goes in there and you melt it, then pour over plain cooked potatoes, and season as you wish. This is served with the usual pickled ‘culprits’: pearl onions, cornichon pickles, mini corn, and something a little special white Asparagus. For the non pickled lovers, there was also lots of fruit and veg: mushrooms, fresh pineapple, canned peaches and pears, and some exotic Thai fruit, whose texture left a lot to be desired. At my meat lover husband’s request, S and D also served meat, which we cooked on the top of the Raclette machine, which is like a mini grill. These were: little sausages, bacon and some sort of beef. 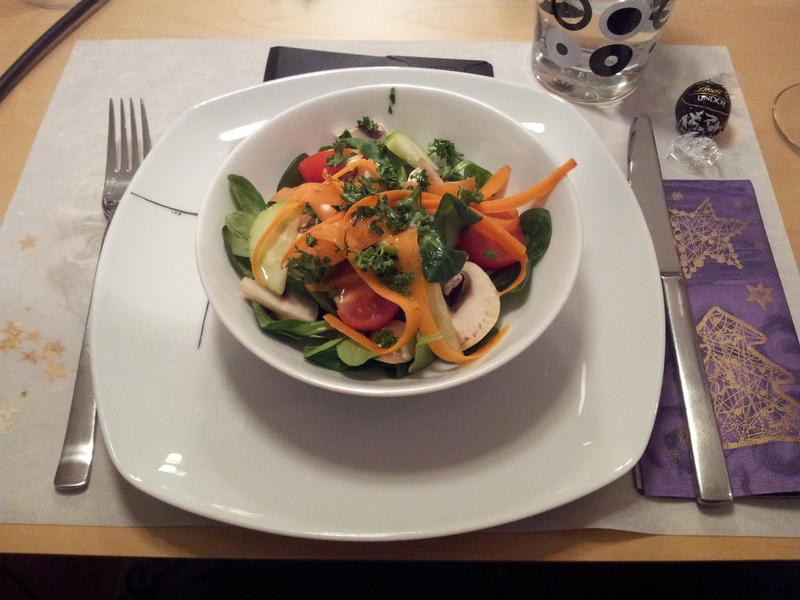 With a fresh salad as appetizer it was a huge meal. But we had a little space for the deserts which Yves’ mom and I contributed, some orange mouse with orange slices (DELISH!) and my Toblerone Mouse (which is really a cream). I didn’t have any of the Toblerone Mouse( but dragged it to Kemi’s the next day), but thoroughly enjoyed the light refreshing Orange Mouse which was the perfect accompaniment to lots of melted cheese. As a Christmas fanatic, I loved getting the chance to observe how this family, celebrates Christmas. I guess I am part of this family, but I meant S and her kids, not Yves’ parents and sister. Maybe it was the caroling after the tree had been lit, or the special way S read a Christmas story to her kids (and us) before they unwrapped their presents, but in any case I can probably say it was the best Christmas Eve I’ve had so far. 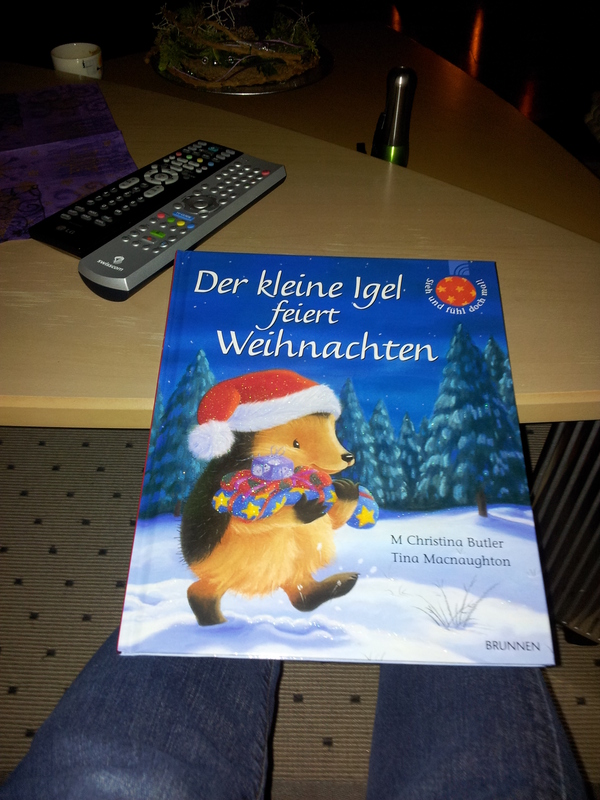 Our Christmas Story. Great book by the way! Lovely illustrations, lovely story! Hope you enjoy the pictures, as poor quality as they were. I used my Samsung Galaxy because neither Yves nor I had remembered to bring our cameras in the Christmas stress. 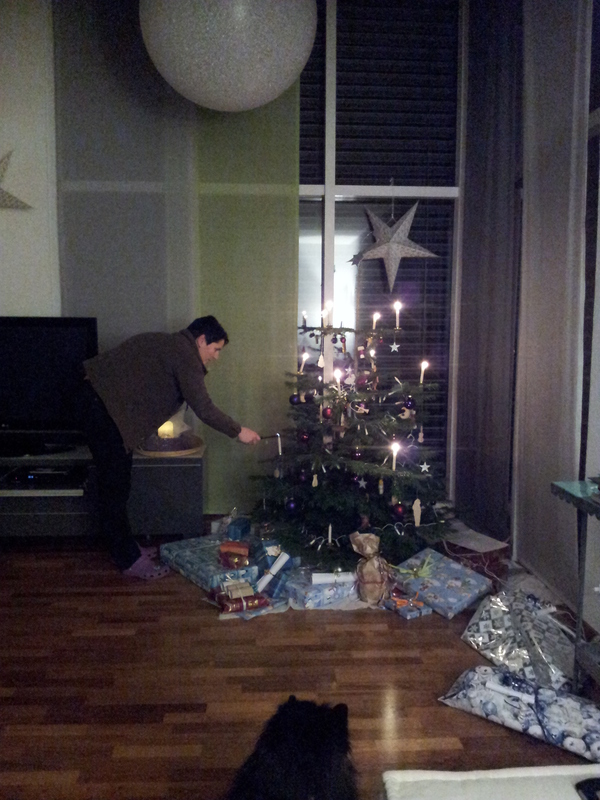 S. lighting the tree. Zagan, Yves’ Parents Dog is that black blob on the floor. 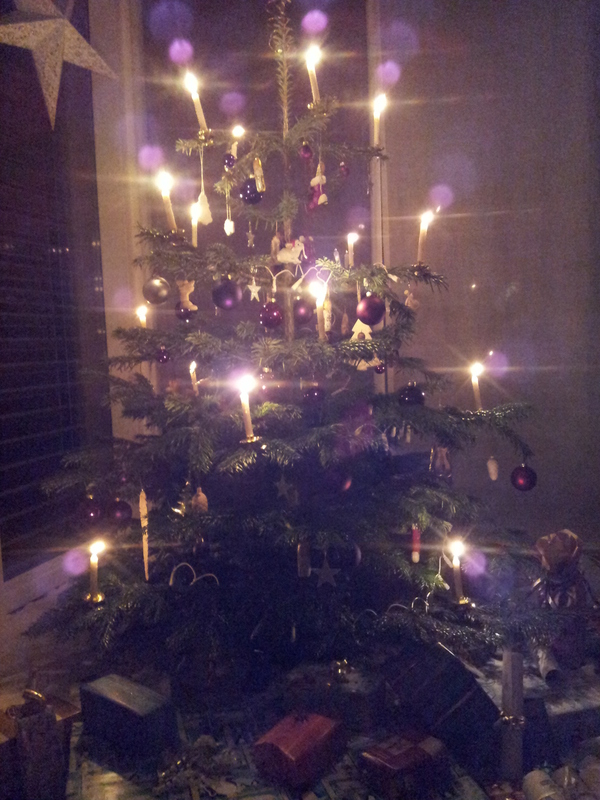 Traditional Swiss Christmas Tree, with candles. 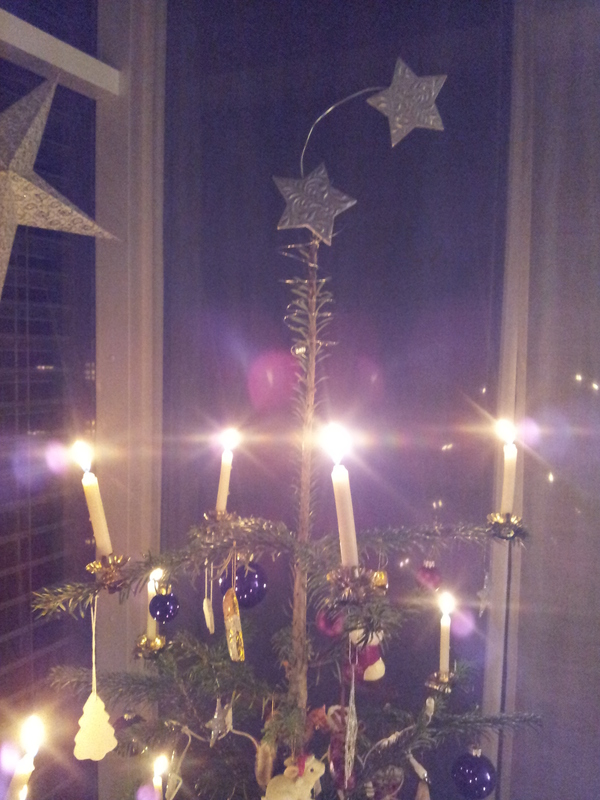 Because the Swiss use real lit candles, the top branches are very far apart. Tell me about your Christmas Eve! Do any of you out there do anything special on Christmas Eve or is it like it is in Bermuda, just preparing for the big Day: Christmas Day? Or do you too celebrate Christmas on Christmas Eve. I would love to hear how it is in your house. Even if you’re a family member of mine! Tell me, I want to hear.